In her BAFTA award-winning debut feature, Rungano Nyoni crafts a satiric feminist fairy-tale set in present-day Zambia. When 9-year old orphan Shula is accused of witchcraft, she is exiled to a witch camp run by Mr. Banda, a corrupt and inept government official. Tied to the ground by a white ribbon, Shula is told that she will turn into a goat if she tries to escape. As the only child witch, Shula quickly becomes a local star and the adults around her exploit her supposed powers for financial gain. Soon she is forced to make a difficult decision – whether to resign herself to life on the camp, or take a risk for freedom. 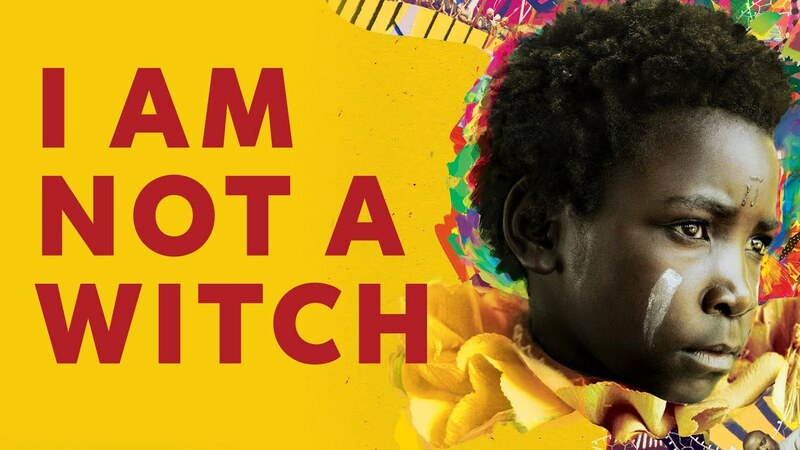 A hit at over 50 international festivals, I AM NOT A WITCH is a must-see for anyone interested in new African Cinema and contemporary female filmmakers. Short film, Mwansa the Great, directed by Rungano Nyoni. "Possibly the year's most audacious film debut, "I Am Not A Witch" has won numerous awards, including Britain's BAFTA for best first feature, and to see it is to understand why…Written and directed by Zambian-born, Wales-raised Rungano Nyoni, this smart and savage satire is impressive for the way it joins a dramatically involving story with a Swiftian tale of human society in general and Africa culture and customs in particular… Beguiling...wickedly smart. " "Beautiful and unsettling…It is a remarkable, strange and politically potent first film." "Sharply observed, symbolically astute…Nyoni’s frank, confrontational style is both derisive and empathetic; she extracts powerful symbolic images from the oppressive environment…Short word on a remarkable movie opening today, I Am Not a Witch, Rungano Nyoni's first feature; also, the images of ribbons and huge spools on the truck are among the most striking cinematic objects, both practical and symbolic, that I've seen in a while. " "The movie is at once a gorgeous, solemn look at the way a society’s rituals can lead to hysteria, and a scathing, at times almost shockingly funny satire of national corruption… I Am Not a Witch is unquestionably one of the most striking debuts of the year, a parable-like indictment of the tourism industry and the destructive effect when tradition runs headlong into capitalist desire. " "Beneath the weight of history, Nyoni’s film possesses a wry, sober-minded sense of humor that elicits the pained chuckles of viewers unsure of whether to laugh or cry…[she] paints portraits of implied mysticism with elegance and precision." "Nyoni’s direction—for which she won a BAFTA award—is bold and ambitious, and challenging at times... Nyoni is clearly confident in her vision and the story she wants to tell, and in her capable hands, the result is spellbinding." "Striking…I Am Not a Witch, the dazzling first feature of writer/director Rungano Nyoni, is pitched uneasily between comedy and tragedy. One is never quite sure whether to chuckle at the superstitious absurdity of this magical-realism tale, or weep with despondency over the repugnant institutionalized misogyny it depicts. " "If you’re in one of the cities where the strange and beautiful I Am Not a Witch opens this week, you’re lucky. See it, then hold your breath to see what first-time feature director Rungano Nyoni does next. " "Narratively and tonally, I Am Not a Witch occasionally invites comparisons to the work of Michael Haneke and Yorgos Lanthimos. Visually and aurally, though, the film marks the arrival of a unique and scintillating auteur. With a well-matched director of photography in David Gallego (Embrace of the Serpent), Nyoni presents one dazzling set piece after another. Her preferences for long takes, bright colors, and dynamic wide shots that resemble paintings cement the film as high art for its imagery alone." "“I Am Not a Witch” is one of this year’s very best films — a blast of absurdist outrage that’s seriously funny until all of the sudden it’s not anymore." "You don’t get many opportunities to see a film where you feel like you are witnessing the birth of an important new talent but “I Am Not A Witch” is one such film. “I Am Not A Witch” is a film of beauty, grace, deep humanity, and fierce intelligence. Nyoni’s ability to craft such a multi-layered film and complex film is simply spellbinding." "I Am Not a Witch deserves to be watched again and again. That’s how rich with meaning it is. Moreover, it needs to be discussed, written about, and shared. It is a testament to the strange and mysterious power of cinema, which has been so masterfully harnessed by its director. ... So, if you get anything out of this review, let it be this: Watch this film. Tell others to watch it, and allow it to activate you. It might be an uncomfortable, even harrowing experience, however it is also an exciting one, because I believe Rungano Nyoni is going to change cinema, and it may never be the same again."